Andersson, S., & Nakahashi, M. (2017). The evolution of a SAL desk: From academic writing to language support. Studies in Self-Access Learning Journal, 8(4), 323-333. 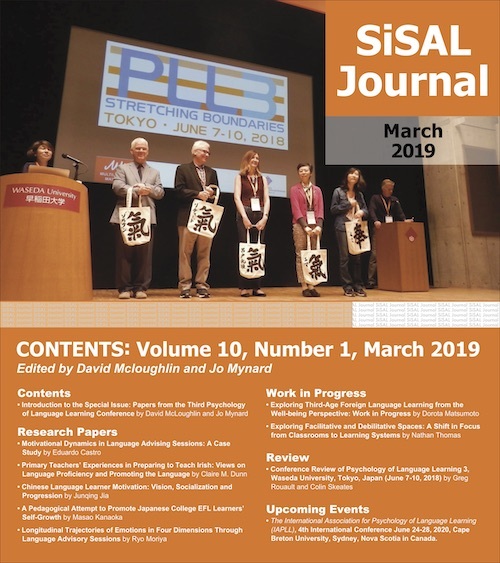 The Center for International Affairs within the Graduate School of Engineering at Osaka University created its own Self-Access Learning (SAL) desk initially as an effort to support its students’ writing capabilities. The Academic Writing Help Desk, as it was initially called, soon became popular after opening in 2015. For the 2016 school year, several issues, opportunities and additional needs were addressed, and the Center decided to expand the desk’s purpose and services to incorporate the English output capabilities of writing, presentations and conversation. The desk was renamed to the Language Support Desk, and it has continued to show impressive results in adding value for the engineering students. This paper briefly describes the creation of the Academic Writing Help Desk, and then explains its substantial changes, as well as the results for the 2016 operations. Discussion points are finally provided for future considerations. With the world becoming more globalized and interconnected, it becomes necessary for Japanese students to have the ability to interact with people around the globe. To accomplish this, English communication abilities are essential to share research and participate in global dialogs. Unfortunately, English proficiency remains a struggling point for many Japanese college students including those at Osaka University. Particularly, there is a significant deficit regarding English output skills such as writing and speaking. For example, research has shown a large gap between Japanese students’ English writing level at the time when they graduate from High School, and the English proficiency level required for university academic writing (Yoshida, Johnston, & Cornwell, 2010). The implication of this is that even if research demonstrates outstanding results, or if students have great ideas worth sharing to the world, the significance and value will be diminished unless they can express them in English properly. If students could gain support to better their English output abilities, it can motivate them to be confident and positive towards global interactions. Students at Osaka University’s Graduate School of Engineering are therefore encouraged to increase these competencies by writing their theses in English and participating in international conferences. However, access to guidance in these areas was nearly nonexistent, and several students voiced their concerns. Under this situation, The Center for International Affairs within the Graduate School of Engineering decided to create a writing desk in 2015 called the Academic Writing Help Desk. Before introducing our writing desk, a brief history of writing centers will be provided. Writing centers are a form of Self-Access Learning (SAL), in that they are supplemental services freely accessible outside of the classroom. The first writing centers were established in the United States in the 1930’s (Williams & Severino, 2004). There is therefore an abundance of research regarding how to open an American writing center (North, 1984) including prior research showing the necessary way of training employees, and the specific contents of carrying out effective sessions (Lipsky, 2011; North 1984). However, given the short timespan that writing centers have been implemented in Japan, there are relatively fewer studies on creating writing centers (Ota & Sadoshima, 2013; Yoshida et al., 2010). The value of writing centers is increasingly becoming recognized across universities in Japan as a beneficial supplemental learning system outside of the classroom (Iwasaki & Mibuchi, 2013). When facilitating a writing center, researchers argue certain basic philosophies. For writing support, the focus should be on making better writers out of students rather than making their sentences better (North, 1984). In other words, it is important to nurture independent writers (Ota & Sadoshima, 2013). The International Writing Centers Association defines the following six points as the concept of a writing center: 1.) Sessions are offered in a one-to-one setting; 2.) Tutors are considered coaches and collaborators, not teachers; 3.) Each student’s individual needs are the focus of the sessions; 4.) Experimentation and practice are encouraged; 5.) Writers work on writing from a variety of courses; 6.) Writing centers are available for students at all levels of writing proficiencies (Harris, 1998). Based on the definitions above, each university sets its own purpose and format according to students’ needs, the available budget and the school’s goals. The instructors of writing centers can be hired as either full-time or part-time employees, or as student tutors after undergoing certain training. There are a variety of reasons for students utilizing a SAL desk’s services, and educational institutions decide whether their participation is mandatory, voluntary, or a mix between the two. The Center for International Affairs at Osaka University is involved in several activities including increasing the English abilities of students. This is because in order for the students to have meaningful international exchanges, it is also required that they are able to communicate their ideas through a common language such as English. As mentioned earlier, we expressed a goal of increasing the English research output ability of the engineering students by opening our Academic Writing Help Desk. Previously, students often came to the Center and voiced their concern that there was no available service to help them write their academic papers or complete application forms for studying abroad or international internships. While there were English classes available to the students, they required a service that could address their individual needs. Initially, we visited several writing centers at universities in Japan for guidance on establishing a writing desk. In addition, we interviewed various teachers involved in academic writing at Osaka University regarding students’ needs and writing abilities. We compiled this information and repeatedly contemplated the type of writing desk that would be necessary for the students of the School of Engineering. In considering our facilities, (Yoshida et al., 2010) points out that it is not necessary to have exquisite amenities and equipment from a writing center’s beginning. Many university writing centers start with small-scale operations and gradually improve and expand by maintaining a positive record and showing their importance to decision makers. We were therefore able to start the desk by utilizing the minimal available facilities of tables and chairs within an open multipurpose space. After the planning was completed, the desk opened in April of 2015; its purpose and goals would eventually be expanded a year later as will be explained in the later portion of this paper. The Academic Writing Help Desk was established within the Center for International Affairs (Nakahashi & Andersson, 2017). The hours of operations were set to 9:30 to 17:00, Monday through Friday, as well as occasional availability outside class periods such as during summer vacation. The target students included undergraduates and graduates belonging to the School of Engineering. The format of the sessions included 1-on-1 interactions lasting 45 minutes at a time. The writing support that the students received help on included reports, essays, conference presentation scripts and more. Importantly, unlike an editorial service, the focus was on creating independent writers by supporting students’ learning. We recruited native-level international students in the school’s doctoral course as tutors, and they underwent initial training. Finally, we prepared an online booking system for students to freely make reservations. Despite minimal facilities and budget, the desk had approximately 200 sessions in its first year, far exceeding our initial expectations. In addition, the satisfaction level of the user questionnaires was exceedingly high. Therefore, we considered the first year of the Academic Writing Help Desk a great success. Despite the desk’s accomplishments, however, some problems arose that prompted the necessity to make significant changes for the 2016 school year. For an additional breakdown of the results, please refer to (Nakahashi & Andersson, 2017). Among the desk’s issues, the most significant included the management of tutors, convenience for the students and additional needs being required beyond writing support. First, managing the tutors’ scheduling was tremendously time-consuming. While the hours of operations were posted as five days a week, our budget could not allow for the tutors to be working during the entire time. Instead, when a student booked a session, we needed to manually find an available tutor every time to conduct the session. Due to the tutors being students themselves, their school lives sometimes interfered with their availability. We therefore needed a new system with set hours where someone could be assured to be in the office to conduct the session. Next, since many of the students have complicated theses that are intended for international journals, it became apparent that they needed to see the same tutor every time to avoid having to repeatedly explain their papers. We also wanted the tutors to be able to build rapport with the students and track their progress over time. Unfortunately, we were not able to guarantee this given the issues with the scheduling system. The scheduling system made it even more inconvenient for the students by requiring them to book sessions and submit documents ahead of time at least one week in advance. Students frequently needed assistance much sooner than this. Finally, students expressed additional needs besides writing. Particularly, they wanted to improve other output capabilities such as becoming proficient with public presentations and oral communication. Therefore, after running the writing desk for a year, it became clear that we were only covering the surface of the students’ needs. For all the reasons mentioned above, we decided to overhaul the writing desk for the 2016 school year. Part of this process included visiting the writing centers of three U.S. universities to obtain a better understanding of managing a SAL desk (Andersson & Nakahashi 2016). Given the above issues and additional needs, we reopened our SAL desk in April of 2016 with a different model and name. The desk’s name was changed to the Language Support Desk, and its goal was to focus on the broader English output services of writing, presentation and conversation. With the implementation of the desk and its services, the administration and operations substantially changed. Whereas we previously hired exchange students to conduct the sessions and matched them with students whenever a reservation was made, the new desk now includes just one dedicated instructor to manage and conduct all sessions. The desk also minimized its hours from five days a week to three days, and the instructor works at the desk regardless if there is a reservation or not. When there are no reserved sessions, the instructor is responsible for managing the desk’s operations and creating learning materials. Together, this allowed us to ensure coverage for each session while simultaneously alleviating the need to manually match instructors with students. Besides the benefit of having a systematic desk that minimized its administrative requirement, the new changes created convenience for the students as well. Without the need to manually match tutors with reserved sessions, we are now allowing students to book sessions and submit their documents just two days in advance (or even earlier in urgent situations). Additionally, students can see the same instructor every time who is familiar with their work. We can also make notes on students’ goals and progress that are made over time. The session lengths remain unchanged at 45 minutes, and we now offer tea, coffee and sweets to make the students feel more comfortable. Given the success of the writing desk in 2015, we continued offering writing assistance sessions with the same format. That is, the focus is not simply on correcting essays, but on encouraging students to become independent writers. Students often need to come back several times to finish essays, as we limit each session’s word count to ensure an adequate pace. Many of the writing sessions revolve around academic papers, but also include assistance with internships and study abroad applications, as well as studying for the writing portions of English proficiency exams. Presentation sessions were created in response to students wanting assistance with explaining their research in front of an audience. For example, many of the students have never presented their research in English at international conferences, and they expressed their anxiety in doing so. The presentation sessions usually consist of a start-to-finish process where we first work with the students’ presentation script and slides, checking for grammar and usage of visuals. We then practice pronunciation of difficult words and pacing. Finally, the students practice in front of a projector while the instructor coaches on proper delivery and provides advice. The third service, conversation sessions, is focused on preparing students for English oral interactions both in academic and social environments. For example, some students are preparing for dialogs at international conferences, while others are practicing for interacting with foreigners while studying abroad. There are also many students that are preparing for the speaking portions of English proficiency examinations. Focus is given on keeping conversations flowing and using correct grammar and pronunciation. We take notes on common mistakes and work with the students during the sessions, aiming towards gradual improvement. Most importantly, we want to build the students’ confidence, and we therefore do not concentrate on correcting every mistake. We calculated that The Language Support Desk had 371 accumulated sessions for 9 months of operations from July 2016 to March 2017. This far exceeded the prior year despite limiting the hours of operation to three days a week. A breakdown of the types of students can be seen in Figures 1, 2 and 3. The results show that approximately three quarters of the writing and presentation sessions consisted of masters and doctoral students. A reason for this may be because these students are required to write their research in English and have a greater probability of attending international conferences. Alternatively, the greatest proportion of conversation sessions consisted of undergraduate students. Figure 4 shows the types of sessions that were reserved. Writing sessions were the highest, while presentation and conversation sessions were similar to each other. A reason for the presentation sessions being the lowest might be due to students using the desk only when they had a specific presentation they wanted to work on. Likewise, some students may be motivated to improve their general writing and conversation abilities, and therefore reserved sessions on a weekly-basis. Along with a higher number of sessions compared to the previous year, the Language Support Desk had other accomplishments. Since students continued booking sessions over the course of multiple months, they were able to report to us the results of the items we worked on. For the writing sessions, a number of the students who frequently returned said that they had their English papers accepted to international journals. Additionally, other students told us that their applications were accepted into international internships and study abroad programs. For the presentation sessions, several of the students that had sessions over the span of multiple weeks traveled to international conferences in various countries and presented their research in English. Additionally, other students stated that they are confidently presenting their current research to their Osaka University lab professors. One particular student qualified as a finalist in a national English presentation competition after reserving sessions every week for several months. The results of the conversation sessions are also impressive, and we believe the students are gaining confidence in sharing their ideas in English. They express enthusiasm about improving pronunciation difficulties, and are diligently preparing for face-to-face interactions with foreigners by asking about communication strategies and cultural differences. In addition, the desk has also helped many students practice for speaking portions of English proficiency exams; this would otherwise be difficult to prepare for without one-on-one interactions and coaching. We use several textbooks for proficiency exams, as well as create our own teaching materials. In future years, we would like to collect specific data related to the results mentioned above rather than relying on students coming back and reporting to us. This will be important in gauging the impact that the desk is having on students, as well as providing more concrete results to portray the value of continuing the desk. In looking back at the desk’s operations while also looking to the future, we have noticed several issues and opportunities that can be addressed. Regarding the issues, the budget continues to be a hindrance in terms of long-term focus and future expansion. The desk’s budget is approved annually, and this has in turn created a short-term administrative focus in our goal setting. And given that the budget remains the same each year, we cannot hire additional instructors or increase available session slots regardless of demand. Another issue is that some students are coming in last-minute to get help, either of their own accord, or they hear about our services too late. Their timeframe of completing assignments or improving their English proficiency is therefore sometimes short, and this makes it difficult to spend the required time to instill independent writing, presentation or conversation skills. We hope to fix this by increasing our advertising efforts and partnerships with faculty members and other campus programs. A third issue relates to the consistency rates of students’ participation, as is the issue with several SAL entities. Given that sessions are completely voluntary, some students will be diligent in using the services over the span of several weeks or months, but will stop coming for unknown reasons. Others will continue coming for specific projects, and will disappear once their assignment is completed. We would like to see students returning consistently to focus on gradual improvement rather than short-term goals. Therefore, the ability to collect data on why students stop coming would be beneficial in the future. As for the discovered opportunities, we found that offering multiple services has indirect benefits in that students who come for one service often come back for other services. For example, a student who comes back weekly to practice conversation may find the need to write a paper or conduct a presentation in English. Since the student already knows about our services and how to reserve an appointment, we believe they are more likely to take full advantage of the desk’s other features. Another opportunity we found is that many students are using word-of-mouth advertising. Oftentimes when asked how students heard about the desk, they say that their friend already uses the services and recommended them to come. It is our hope that this type of advertising will naturally increase as the number of sessions grow. 2016 marks the second year of our SAL desk. It continues to be run as a small operation at minimal cost while remaining popular. Through trial and error, it has now become a place to support the English output skills of many students. By actively using the desk, students can acquire abilities to raise their communicative confidence and cultivate positive attitudes in participating in the international community. As mentioned earlier, the ability to produce English communication output results is an important key to nurturing globally active students; we hope that the desk can continue contributing towards this. However, several issues remain, and the desk’s future role remains unclear. To that end, securing an adequate budget for long-term operations will become a major concern for the future, and we will need to continue emphasizing the importance of the desk within the university. A wide range of collaboration with other campus entities such as libraries and regular classes for English academic assistance will also be required. If allowed to continue and expand, we hope to create additional services such as drop-in hours, weekly scheduled appointments, and host various workshops. Ultimately, our long-term goal is to one day turn our Language Support Desk into a Language Support Center. Iwasaki, C., & Mibuchi, H. (2013). 初年次教育においてライティングセンターを活用した学生のレポートとTAによる相談記録の分析 [Analysis of consultation records by TA’s and students’ reports using the writing center in Freshman education]. Proceedings from the 29th conference of Japan Society for Educational Technology (pp. 249-250). Tokyo, Japan: Japan Society for Educational Technology. Lipsky, S. (2011). A training guide for college tutors and peer educators. Boston, MA: Pearson Education. Ota, Y., & Sadoshima, S. (2013) Tutor training and PAC analysis of two tutors’ awareness towards tutorial sessions: Waseda University Writing Center’s case. Waseda Global Forum, 9, 237-277. Yoshida, H., Johnston, S., & Cornwell, S. (2010). Introduction to university writing centers. Journal of Osaka University of Economics, 61(3), 99-109.